Clicking on the gear icon at the top of the page. From the drop-down menu, select ‘Add child’. 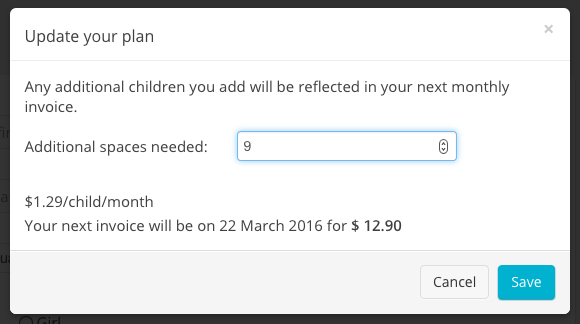 If you have run out of spaces, admins will see a message saying, "You have reached the maximum number of children allowed on your current plan. Click here to add more spaces to your plan." Click the save button and your plan will be updated. If you are on an annual plan, you will be invoiced for any additional children you add, based on the remaining months on your annual plan.